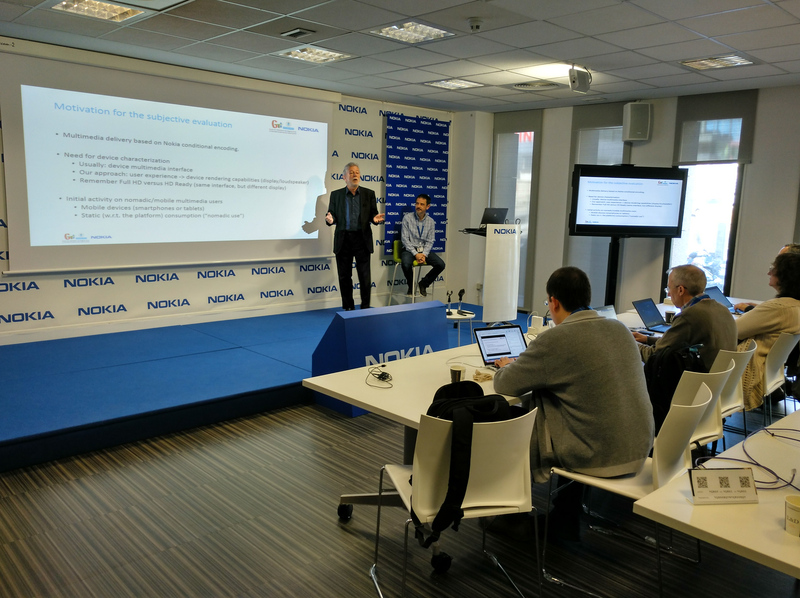 At the 2018 spring VQEG meeting in Madrid (Spain), hosted by Nokia Bell Labs, Narciso García and Juan Casal presented some results on device characterization for conditional encoding, outcome of a Nokia-UPM joint project. According to the two-step assessment methodology, there was a pre-pilot to evaluate the experimental setup and procedures, before the tests were conducted. The presentation described the modifications of the assessment procedure, the selection of new reference contents, the test, and the results. Multimedia consumption in isolation from the environment through the use earplugs was assessed on three smartphones and one tablet. The results confirm the adequacy of the use of the new spatial resolution ladder and show clear guidelines for audiovisual delivery to mobile devices. Nevertheless, the influence of content selection and of he personal preference on device characteristics should be further analyzed. This activity of GTI is supported by the Spanish Projects IVME (Immersive Visual Media Environments) and Bustop (Search of Optimal Transcodings).